In this project, we are going to use a PIC microcontroller to remotely control few AC loads by just using an IR remote. 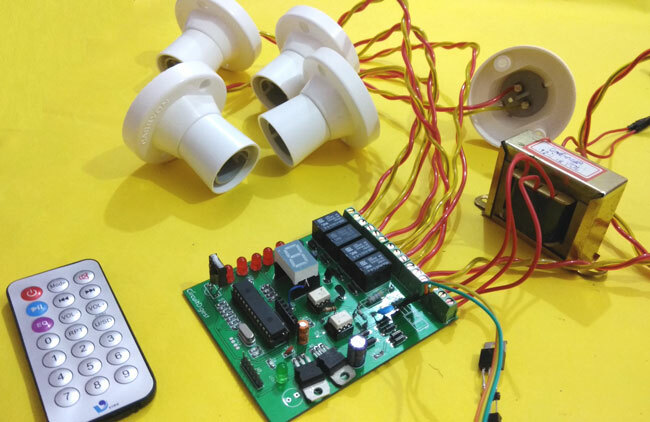 A similar project IR remote controlled Home automation has already been done with Arduino also, but here we designed it on PCB using EasyEDA’s online PCB designer and simulator, and used their PCB designing services to order the PCB boards as shown in the subsequent section of the article. At the end of this project you will be able to toggle (ON/OFF) any AC load using an ordinary Remote from the comfort of your Chair/Bed. To make this project more interesting we have also enabled a feature to control the speed of the fan with the help of Triac. All these can be done with simple clicks on your IR remote. You can use any of your TV/DVD/MP3 remote for this project. The different IR signals from the remote are received by the microcontroller which then controls the respective relays via a relay driver circuit. These relays are used to connect and disconnect the AC Loads (Lights/Fan). The working of this project is fairly simple to understand. When a button is pressed on the IR Remote it sends a sequence of code in form of encoded pulses using 38Khz modulating frequency. These pulses are received by the TSOP1738 sensor and then read by the Controller. The Controller then decodes the received train of the pulses into a hex value and compares it with the predefined hex values in our program. If any match occurs then the controller performs a relative operation by triggering the respective Relay/Triac and the corresponding result is also indicated by on-board LEDs. Here in this project, we have used 4 bulbs (small bulbs) of different colors as lighting loads and another bulb (bigger bulb) is considered to be a fan for demonstration purpose. We have selected key 1 to toggle the relay1, 2 to toggle the relay2, 3 to toggle the relay3, 4 to toggle the relay4, and Vol+ to increase fan speed and Vol- to decrease speed of the fan. Note: Here we have used 100watt bulb instead of a fan. Our PIC microcontroller operates at +5V and the Relays operate at +12V, Hence we use a transformer to step down the 220V AC and rectify it using a full bridge rectifier. This rectified DC voltage is then regulated to +12V and +5V by using the regulator ICs 7812 and 7805 respectively. To trigger the relay we make use of transistors like BC547 which can act as an electronic switch to turn ON/OFF the relays based on the signal from the PIC microcontroller.Further to control the speed of the fan we are using a TRIAC. TRIAC is a power semiconductor which is capable of controlling the output voltage; this capability is used to control the speed of the fan. We have also used a Triac Driver to control the Triac using our PIC microcontroller. This driver is used to give a firing angle pulse to Triac, so that the output power can be controlled. Here we have used 6 level of speed control. When the level is 0 then the fan will be off. When level will be 1 then speed will be 1/5th of full speed. When level will be 2 then speed will be 2/5th of full speed and respectively for others. The current level of the speed can be monitored using the on-board 7-segment display. The block diagram of the project is shown below. All these components are commonly used and can be easily purchased. However if you are looking for a best buy online then we would recommend you LCSC. LCSC is a great online store to buy your electronics components for all kinds of projects. They feature about 25,000 kinds of components and the best thing is that they sell even small quantity items for small projects and they also have Global Shipping. As said earlier you can use any kind remote for your project. But we have to know what kind of signal is generated for from that particular remote. For every individual key on the remote there will be an equivalent HEX value for that key. Using this HEX value we can distinguish between each key on our microcontroller side. So before we decide to use a remote we should know the HEX value for the keys preset in that particular remote. In this project, we have used a NEC remote. The HEX values for the keys on a NEC remote is given below. As you can notice the HEX value has 7 characters out of which only the last two differs, hence we can consider only the last two digits to distinguish between each keys. The schematic for the project is shown below. The above schematic was made easy by using esayEDA schematic editor since they provide the layouts of all components used in this project. It also does not require an installation and can be used online on the go. The pinouts and component values are clearly specified in the schematic above. You can also download the schematic file from here. The program for this project is done using MPLABX, the code is also pretty simple and easy to understand. The complete code will be given at the end of this tutorial, further few important chunks of the program are explained below. In the beginning of the code, we should include required libraries, define the pins and declare the variables. After that, we have created a simple delay function by using the “for” loop. Now in the main function, we have give directions to the selected pins and initialize timer and external interrupt int0 to detect zero crossing. Now, here we are not using any interrupt or capture and compare mode to detect IR signal. Here we have just used a digital pin to read data just like we read a push button. Whenever signal goes high or low we just put debouncing method and run the timer. Whenever pin changes its state to another then time values will be saved in an array. Now to know at which our fan is currently operating, we should use a 7-segment display. The following lines are used to instruct the pins of the 7-segment display. The below function is for external interrupt and time overflow. This function is responsible for detecting zero crossing and driving the Triac. To design this Remote control home automation we have used EasyEDA which is a free online EDA tool for creating circuits and PCBs in a seamless manner. We have previously ordered few PCBs from EasyEDA and still using their services as we found the whole process, from drawing the circuits to ordering the PCBs, more convenient and efficient in comparison of other PCB fabricators. EasyEDA offers circuit drawing, simulation, PCB design for free and also offers high quality but low price Customized PCB service. Check here for the complete tutorial on How to use Easy EDA for making Schematics, PCB layouts, Simulating the Circuits etc. EasyEDA is improving day by day; they have added many new features and improved the overall user experience, which makes EasyEDA easier and usable for designing circuits. They are soon going to launch its Desktop version, which can be downloaded and installed on your computer for offline use. In EasyEDA, you can make your circuit and PCB designs public so that other users can copy or edit them and can take benefit from there, we have also made our whole Circuit and PCB layouts public for this Remote control Home automation. After completing the design of PCB, you can click the icon of Fabrication output, which will take you on the PCB order page. Here you can view your PCB in Gerber Viewer or download Gerber files of your PCB and send them to any manufacturer, it’s also a lot easier (and cheaper) to order it directly in EasyEDA. Here you can select the number of PCBs you want to order, how many copper layers you need, the PCB thickness, copper weight, and even the PCB color. After you have selected all of the options, click “Save to Cart” and complete your order, then you will receive your PCBs within few days. You can directly order this PCB or download the Gerber file using this link. After few days of ordering PCB’s we got the PCBs. The boards that we received are shown below. Once we received the PCBs I mounted all the required components over the PCB, and finally we have our IR Remote Controlled Home Automation ready, check this circuit working in demonstration video at the end of the article. 1. the list of component here is difference from that on the BOM in https://easyeda.com/circuitdigest/IR_Remote_Controlled_Home_Automation-209f4d85bd7246118b93affeb232f443. 2. please can you clarify on which components are SMD and TH. can PIC16F877A be used for this project? Sir I have no compiler to generate hex file .Please send me the hex file of above project. i do not understand all these codes ... what and what are you trying to do ? and how ,,, full explanation would do better and i'll really appreciate it..
Sir is it possible to use a RF module instead of IR? can u explain in brief how? Hi, can you send the .hex file, or the config.h file pls. thanks, its a bit urgent. it's my final work for school. can i use triac directly with mcu instead of driver and zc. Please send me the mikro c source code version for this project. Also,in the schematic,I did not see the connection between the TSOP1738 and the PIC. Where can i find a comiled version (= *.hex file) of the software? I am using the PIC18F2520 like described on the web page. Secondly i am looking for the exact configuration words for the PIC18F2520. The HEX file for this program is not given directly. You have to compile this program on your IDE to generate the HEX file. Is there needed to fill UN-USED memory to prevent malfunction of operation of the MCU. And could u please let me expand the matter and how to fill the unused memory for a MCU. Cud u please suggest, is mov right choice if so then what spec, of mov should i used for that problems???? hy i am very impressed with your project. but i need some help if you can olease. 1- can i use 4MHZ crystal with this program?? 2- i want to use PIC 16F72 with MikroC can you please convert this code in mikroC?? Nice work. I am a senior citizen and still an electronic hobbyist . I want to make this for my own use. I am not familiar in MPLAB but slightly worked on Micro C after retirement and also can manage writing hex files in Pics. So it will be of great help to this old man if you can send me the .hex file or suitable c file for generating hex in Micro C.
Please comment am i right or nor???? Thanks for nice give nice project .But I have not compile from mplab ide I understand mikroC code for make hex file . Please convert this code mplab ide to mikroC . The author has not provided the config.h file. But you can easily set the configuration bits on MPLABX by yourself without using a librarey for it.